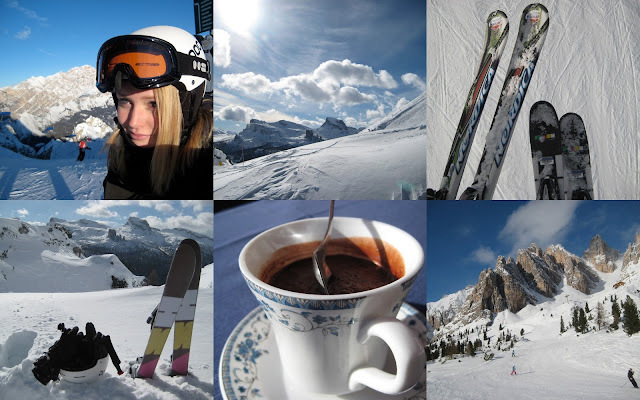 It was a little silent on my blog last week for one good reason: I was in South-Tirol skiing! The weather was flawless, the slopes were nearly empty which meant incredible skiing and I'm totally ready to go back to London and start ploughing through the massive pile of work I have this month! I'll try to blog every other day, if not every day :) For now I have some pictures from last week.. In short, my week consisted of: lots of sunshine every day, snow & cold, snowblades (aka mini-skis, my skis of choice. I prefer it to regular skiing and snowboarding), skiing mostly on the mountains of Cortina D'Ampezzo and Kronplatz, walking the dog, early morning breakfasts, long days, nearly empty slopes and long car drives. In one word: perfect! Oh and my siblings finally managed to get me hooked on their favorite tv show: The Borgias. I thought it wasn't my type of show but I'm super obsessed now!